Kaari Workshops (kaari meaning ‘art’ in Bengali) are a series of creative art workshops started by friends Lea Ramaswamy, Siddarth Jartare, and Trisha Dube. 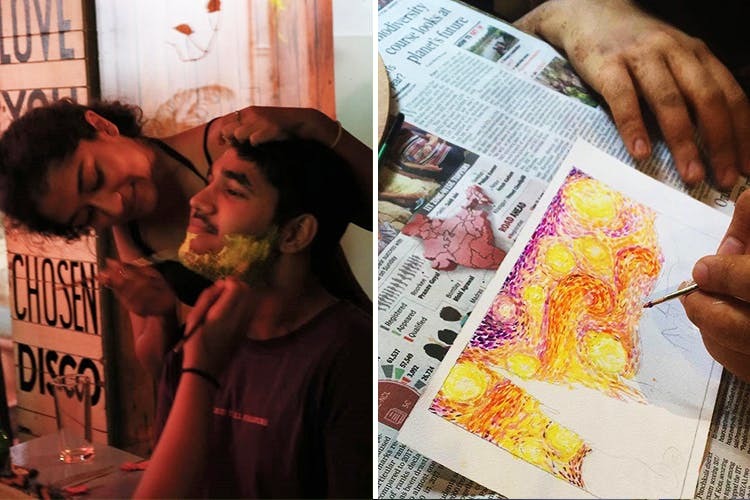 Lea and Siddharth are art students, and though Trisha doesn’t have formal art training, she contributes her own unique perspective to the workshops as well. Initially, the workshops grew from an idea the three had, about how social media plays a huge part in artistic identity – and how it can also help develop someone’s artistic credentials. With each of their unique outlooks on the art world; Lea’s being historical, Siddharth’s being geared from a design perspective, and Trisha’s being more towards using art as a modern marketing tool – they came up with a curriculum that evolved into 6 broadly-themed workshops. Through each of these 2-day workshops, you’ll experience art in a unique, immersive way – while also building community ties. It’s not your stereotypical art ‘class’ where you sit at an easel and follow instructions – it’s free-form learning, through which people can learn more about their artistic identities. Two of their workshops – on ‘meme culture’, and ‘human anatomy and self-image’ has already taken place. The remaining four themes are on articulating emotion, art and money, individuality, and finding your cultural voice. Attending each 2-day workshop will cost you INR 3000 per head, and is inclusive of all the art materials. You can play around with high-quality watercolours, modelling clay, paints, sculpting materials, two DSLR cameras, and anything else you could possibly want. The organisers have invested a lot of money and effort into the supplies and the workshops, which take place at rotating venues around Koregaon Park. We think it’s a great way to learn more about the art world, and express your creative side through different forms of media. Follow Kaari Workshops on Instagram for all the latest updates. The workshops have now been condensed from a 3-day format to a 2-day format (3 hours per day), and you can sign up for the next one via the form, here. The workshops take place on Saturday and Sunday, between the months of June and August.